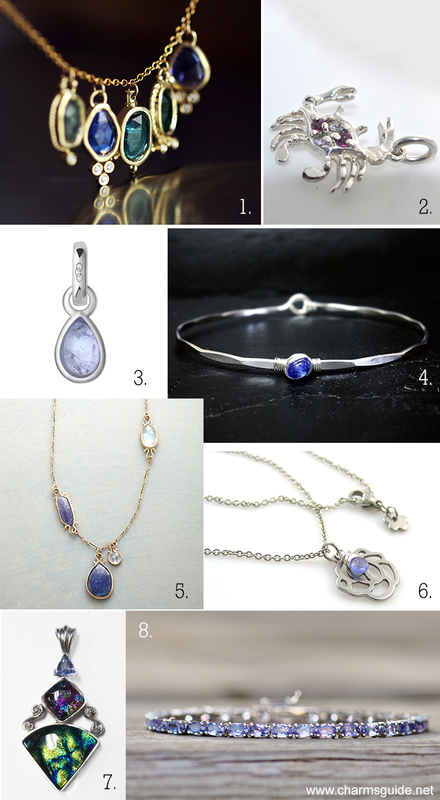 Facts, folklore, healing properties and our curated selection of gorgeous tanzanite jewelry. A mineral discovered in Tanzania in 1967, Tanzanite, scientifically known as blue Zoisite, didn’t become an official birthstone of December until 2002, and is the only addition to the original list from 1912. Tanzanite was discovered after a wildfire on the slopes of Mt. Kilimanjaro by geologist Manuel D’Souza who brought it to Tiffany & Co’s attention. They re-named the Zoisite “Tanzanite” and brought it to the market with great success. It is a popular, rare and consequently expensive stone – it is only found in Tanzania and once the supply is gone, it’s gone. Its natural color is a blue with a brownish tint, and tanzanite is often heat treated to remove the brown hues and deepen that intensley purplish blue color that it is known for. The color also looks different depending on the angle you are looking at the stone from, and it has to be cut just right to show that deep blue color. Tanzanite is also the anniversary gemstone for the 24th year of marriage. Tanzanite is said to help open the heart and third eye chakras and aid in communication with the spiritual world. It is also thought to enhance creativity and wisdom, enhance meditation, and inspire compassion and help with problem solving. It also supports the glandular system. 1. Handmade necklace with tourmaline, tanzanite and conflict free diamond charms. Gemstone charm necklace by Rimon Fine Jewelry. 2. Sterling silver crab charm / pendant set with tanzanite and ruby. Crab charm from OC Jewelers. 3. Tanzanite and sterling silver mini charm. December birthstone charm by Links of London. 4. Sterling silver or gold filled (your choice) bangle bracelet with a micro-faceted Tanzanite. December birthstone bracelet by Niccoletti. 5. 14kt gold necklace with moonstones and tanzanites. Handmade tanzanite omega necklace by Jennifer Dawes. 6. Stainless steel necklace with a rose-shaped and tanzanite charm pendant. Tanzanite charm necklace by Wedunit Jewels. 7. Large sterling silver pendant set with iridescent green/blue dichroic glass and a bright bright blue-purple tanzanite. Tanzanite pendant from Kozma Jewelers. 8. Tanzanite and sterling silver tennis bracelet by Hanging By A Thread.